Our range of products include agitated vessel. In most industrial processes including reactors, heat is to be added or extracted to control the process. The addition and removal of heat is done by passing steam or water in a jacket fitted to the outside of the vessel or passing steam or cold water in helical coil inside the Agitated Vessel. For effective heat transfer and even distribution of heat, the liquid inside is continuously agitated. The present set-up offers us a comparative study of Jacket & Helical coil, which can be operated simultaneously. 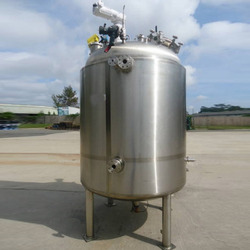 It is a stainless steel jacketed vessel with helical coil of copper is fitted inside. The unit consists of a vessel with class wool insulation ail around. A helical coil made of copper is fixed inside the vessel. A motorized agitator is fixed at the center of the coil. The vessel is provided with an electric heater and a controller is also provided for vessel. Heater heats water in the jacket while cold water is circulated through coll. Temperature of circulated water and water In vessel Is measured and thus heat transfer coefficient at various agitator speeds can be determined. Looking for Agitated Vessel ?